That means thank you in Croatian! And I want to thank the OTSM duo for letting me contribute a few posts this upcoming year. Don't worry, I am of the same mix too! I am Emily's little sister. 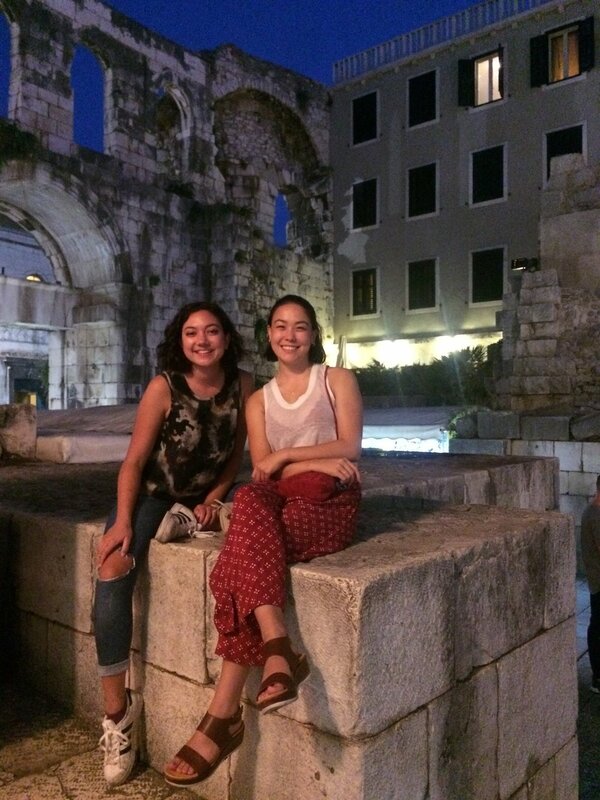 Ever since my friend, Rachel, visited Croatia in 2015, I was waiting for the perfect opportunity to visit with plans of road tripping along the stunning Adriatic and stopping at the beautiful national parks along the way. Croatia is full of islands, UNESCO sites, medieval city centers, and pristine parks. The food and drink is just as fantastic as the sites. Croatia is a top destination for European travelers and is growing and attracting visitors from all over each year. It is affordable, accessible, and offers something for everyone. My childhood friend Sarah (another hapa!) and I met in Europe last September and had an epic Croatia road trip. Here is a quick overview of our 10 day itinerary before we get to the highlights. Rented a car (we got upgraded to a Benz). Stayed a few nights in Janjina outside of Dubrovnik with day trips to Dubrovnik Old Town, Ston, and Miljet. Traveled to Split with a one night stop in a coastal town called Stobrec. Stayed in Split a few nights and made a day trip to Krka. Made our way to Zadar and day tripped to Plitvice. A car was definitely key for our trip and driving was very easy in Croatia. We had a sat. nav./GPS, which was definitely necessary. I think we did an amazing job with our itinerary, but depending on your goals and priorities, I would recommend mixing and matching different experiences. We kept a leisurely pace with the main goals of visiting Plitvice, Krka, and Split old town. With our leisurely pace, we were able to soak up the sun in some unexpected stops. We definitely missed out on some gorgeous islands, but good reason to go back! Find your focus and have an amazing time exploring Croatia! While there are several pros to staying inside a city center, we stayed an hour or so outside of Dubrovnik at a house in Janjina (some excellent and safe Couchsurfing) and had a great time stopping in a small town, lounging on a stretch of rocky beach, and sipping coffee on a cliff overlooking a bay. We saw more of Croatia beyond the Dubrovnik walls. Stay in Zadar as a home base for a day trip to Plitvice. It is still quite a drive, but wake up early and get going! We stayed at a little Airbnb outside the center of Zadar. Our host was adorable and very confused on how two California girls wanted to come to Croatia. Make your way to a cute coastal beach guesthouse. On our drive to Split, we spent the night in a little coastal town, Stobrec. They have affordable and some nice accommodation along the coast. Read reviews because some definitely looked dingier than others. The old town of Dubrovnik is stunning with so many nooks and crannies and staircases to explore. The views are 100. We skipped the overpriced wall walk especially because of the blazing heat, but if you are a true GOT fan or if you have some extra cash to spend, definitely walk the walls. The old town is a UNESCO World Heritage Site. Ston was a little gem that we passed between our housing outside the city and Dubrovnik. It was quaint and we enjoyed Black Risotto Frutti di mare. More walls to climb here if you choose. Also, Ston is on the tentative list for UNESCO. We were a little too casual with our trip to Mljet, not realizing a few logistics of the trip. Alas, travel doesn't always go as planned. Bring your car, know your ferry times, and pack a swimsuit, sunscreen, and snacks! Mljet is very idyllic and you can kayak, splash around, bike, and/or hike. If you rent a car, stop in random cities along your journey. Pick up fruit and olive oil from stands along the highways. And stop anywhere and everywhere. We stopped in a few random cities. My favorite was Primosten—we fell asleep on the beach in the sun like cats! 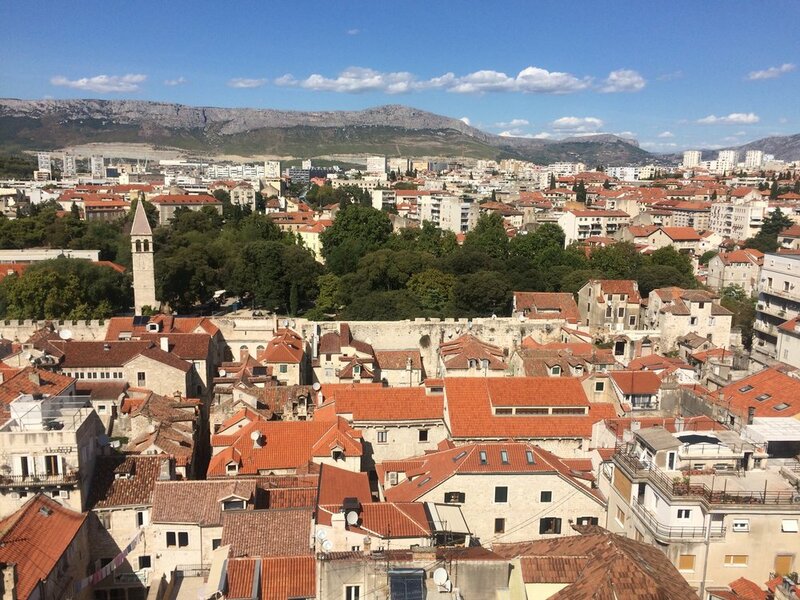 Split is an absolute stunner. Also UNESCO World Heritage for Diocletian's Palace. Get lost in the alleys and roads in medieval Split and walk along the water. Climb the bell tower of St. Domnius Cathedral for great views. Eat and drink and just enjoy wandering around. There are excursions you can do from Split as well. Drive from Split to Krka National Park. First, take a quick jaunt and see the famous falls and pools with tons and tons of swimmers. After you soak up the views, we recommend saving and spending time taking a boat along the river and stopping at the island with a monastery and enjoy the sublime views going through the canyon. At the second and last boat stop, you will find a few hiking options. We chose an uphill hike that got us sweating, but the views were well worth it! We had a bit of rain and a tight schedule with Plitvice, but we made it work! Waterfalls for dayssssss. There are several route options depending on your time frame and what you want to see. You can't go wrong. Each route will have you surrounded by magnificent pools and waterfalls. Also, another UNESCO alert! Zinfandel – although it seems Californian, Zinfandel actually originates from Croatia. Black Risotto – we were loving and living for seafood risotto. UJE OIL BAR!!!!! Potentially the best meal of 2017 located in Split. For our main course, we split a magnificent swordfish dish and an unreal cuttlefish polenta. Words cannot describe how amazing these two dishes were. Our dessert was a lavender cake with chocolate chip ice cream with a drizzle of olive oil. Amazing. There is a also great shop across the "street" from the restaurant with random, classy Split souvenirs. Uje also has olive oil tasting down the "street" at certain times and has a small shop in Split for culinary goods. Day trip to Montenegro or Bosnia. Head north to Zagreb. Sarah departed from Zagreb after we parted in Zadar. She said t was a beautiful, metropolitan city. The other 5 National Parks: Risnjak, Paklenica, Sjeverni Velebit, The Kornati Islands, and Brijuni. Island hop: Hvar, Bol, Korcula, Brac, and more! Cave and/or snorkeling tour from Split. If you don't rent a car, try using FlixBus or other buses if you are interested in going to more than 1 city, but make sure you get to buses early!! I had a little wild wild west experience fighting for seats when I took a bus from Zadar to Split for my flight out. If you visit one city, you can still do day trip tours to Krka and Plitvice. I hope you enjoyed some of my Croatia highlights. My next trip to Croatia is definitely going to focus on the islands and some of the other 5 National Parks!